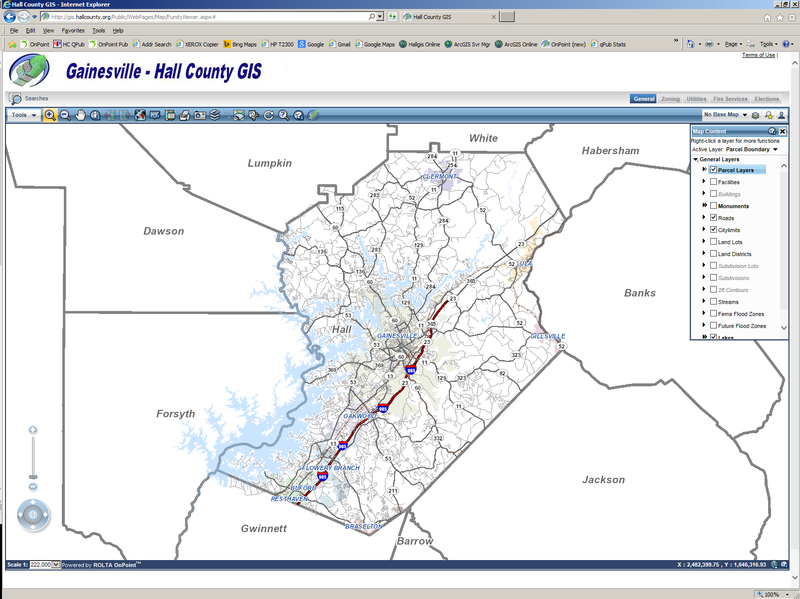 Hall County offers a comprehensive Geographical Information System (GIS) as well as a number of maps for services and facility locations using the Google® mapping APIs. This map service, hosted by qPublic, provides access to parcel & property assessment information and property sales. The map service can be accessed by desktop as well as mobile devices. The data on this web site is updated on a weekly basis. Map layers include: Parcels, aerial photography, zoning, contours. Commission District Map: This map shows the four county commission districts. Clicking on a district opens a window with additional information, including how to contact the district commissioner. 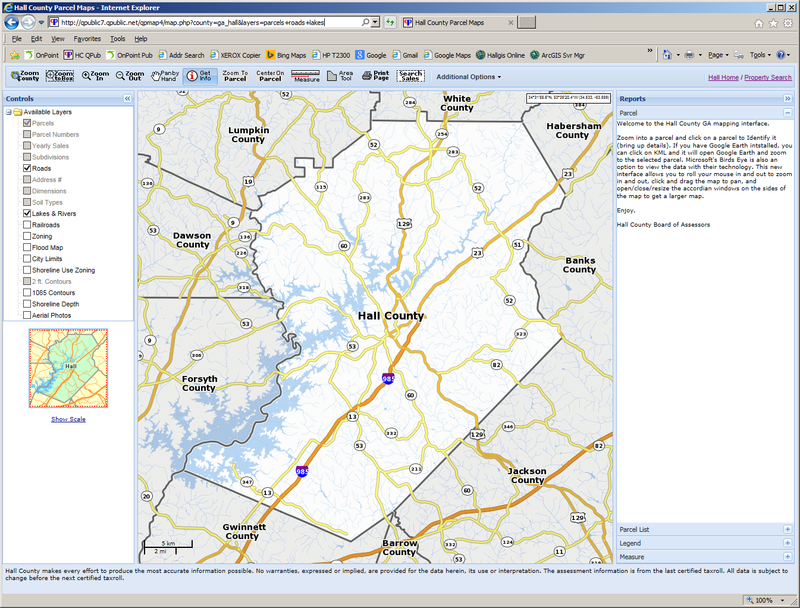 The map service can be accessed by desktop as well as mobile devices. Voting Precinct Map: This map presents the county election precincts and voting locations. Clicking on a district or voting site opens a window with additional information. You should contact the county Elections office for questions regarding your precinct and voting location. The map service can be accessed by desktop as well as mobile devices. County Facility Map: This handy list puts all physical building locations in one convenient map list for the most common public service facilities. IE 9+, Firefox, or Chrome browsers are recommended. Weather Siren Map: A county-wide list of all weather siren locations including the approximate audio radius. Audible radius can be affected by proximate wind and weather conditions and may be greater or less than shown. IE 9+, Firefox, or Chrome browsers are recommended. Sheriff's Facilities Map: A county-wide list of all Sheriff's Office facilities. IE 9+, Firefox, or Chrome browsers recommended. Fire / Med Station Map: A county-wide list of all fire stations and mobile medical units. IE 9+, Firefox, or Chrome browsers recommended. Parks Map: A county-wide list of all park and community center locations. IE 9+, Firefox, or Chrome browsers recommended. Have an idea for a useful county map? Send your suggestions or comments to the webmaster.